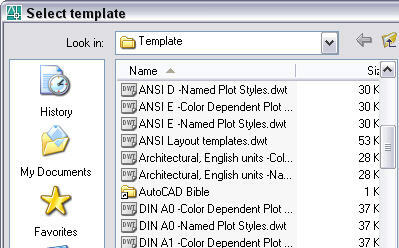 AutoCAD wants you to keep your templates in the Template folder, but you may have different ideas. For example, you may have custom templates that you want to keep in a separate location. However, in the Files tab of the Options dialog box (Tools > Options), you find that you can’t add an additional location for a template, because the Add button is not available, as you see here. Find the folder where your AutoCAD templates are stored. Open the Options dialog box, click the Files tab and expand the Drawing Template File Location item as shown above. Browse to that location in Windows Explorer. In Windows Explorer, choose File > New > Shortcut. The New Shortcut wizard opens. Click the Browse button and browse to the folder you want to use for your templates. Click OK. In the wizard, click Next. 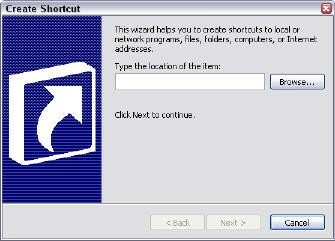 Type a name for the shortcut and end the wizard. The shortcut appears in the file pane on the right. I created a shortcut to my AutoCAD Bible folder. Now, when you choose File > New, you see the shortcut in the Select Template dialog box, as shown here. Double-click that shortcut to display the templates in that folder.